Fiji's future generations are seeing that the easiest way to riches is not via education and hard work. Instead they are being shown by Bainimarama and Khaiyum that a coup, treason, lying, intimidation, beatings, torture, murder and corruption is the easiest path to riches. A nation where the rule of law does not exist. Where the courts are filled with a bunch of corrupt and spineless "clowns" for judges, to eager to bend over backwards to protect their lucrative jobs and perks, rather than uphold the rule of law. Where the less educated are easily fooled and manipulated by sweet talking con-artists bearing cheap gifts and who exploit native culture and traditions. A military and police force where beating innocent people and breaking the law is acceptable and condoned by their land force commander and a shameless commissioner of police. Both of whom don't have the "stones" to do their sworn duty and uphold the law. They both look the other way when crimes against the people are being committed especially by two hooligans insulting their forefathers, the indigenous Fijian people and their race and traditions. 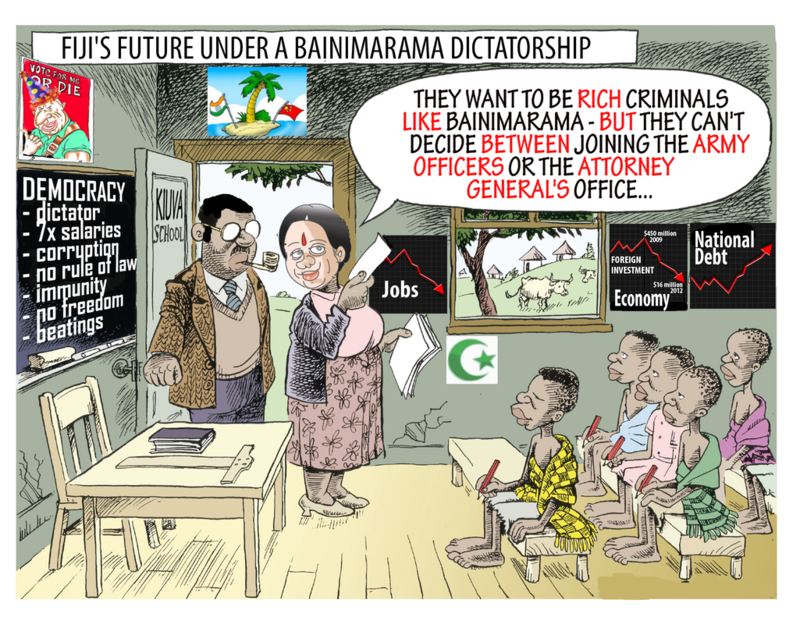 Your children see that beating and murdering people to run from the law like Bainimarama will instil fear and allow them, just like Bainimarama and Khaiyum are doing, to steal Fiji's wealth and appoint stupid, unqualified, and murdering relatives to key positions in government. The downside of this corrupt environment is the poor Fiji economy, high unemployment and crime and suicide and poverty levels. But these evils are all sugar coated by the satanic media, and freedom of speech is only an empty phrase that is repeated so often by the megalomaniac and illegal AG that he has fallen for his own lies. This is the future that lays ahead for YOUR future generations of Fiji. Is it also the future that you want for your children? If NOT, then what are you doing about it?